I'm working on a peripherally SvWo related project, and would like to know how you all think this page looks and if it has what you would want for probability info, or what else you'd suggest? Thanks for any feedback and feel free to use this in good health. New! D6Party Dice FontPack! Just $1! 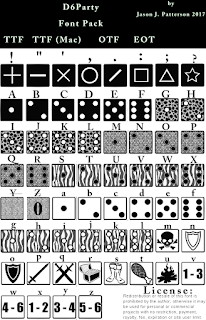 Do you need a simple font with some D6s (six-sided dice) of various kinds and patterns, and a few other RPG elements? This is the font for YOU! 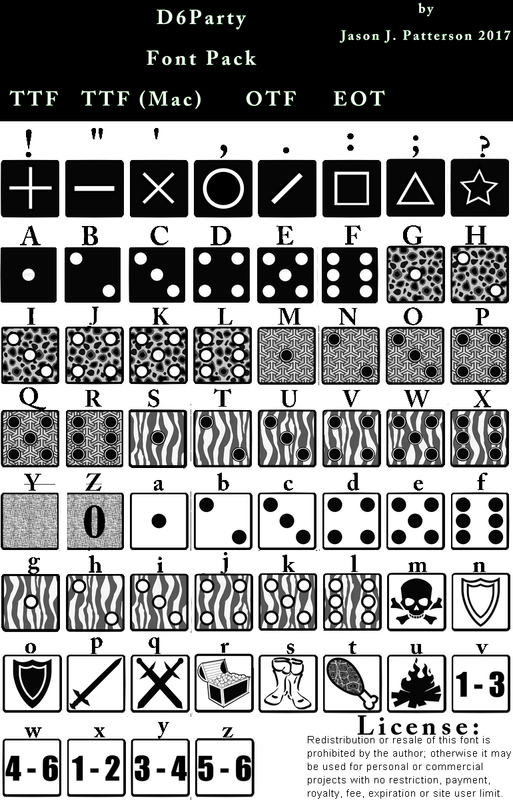 I was trying to find a dice font to make a random table, and I couldn't find any good free dice fonts like I was looking for, so I made this! I hope you like it! Check it out, drop me a line or comment, give me some feedback! Well, I have not seen the rules so this isn't a review, but someone on Facebook made me aware of this recently and I have to give it credit for novelty. It looks, from all the reviews, like it's well made and engaging, and for some, will scratch the itch that most likely no RPG has directly, tacitly scratched until now. At $13 for print or $6 for ebook, it's hard to justify against anyone interested in this idea passing it up. If anyone has any thoughts on it, I'd be interested to see them, and maybe post them in an updated article. Enjoy! Hey everyone! Online now is the Abstruse Decapod Venue Generator, which will give you arenas, fairgrounds and all manner of cities and states, from 300 to 150,000 capacity, within the US (foreign additions coming late). 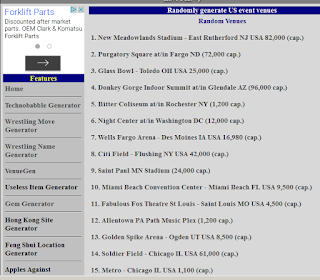 There is a base of 1500 real venues, plus totally random generation of new fictional arenas just for YOU! This is pefect for anyone needing a place to visit in an rpg (music club, gathering) or the choice for a wrestling card! This is a new video I made. It's a sort of review of what's in the box for Avalon Hill's "Wrasslin'" bookcase pro wrestling game from 1990 - sorta like an unboxing but it was already unboxed before this! 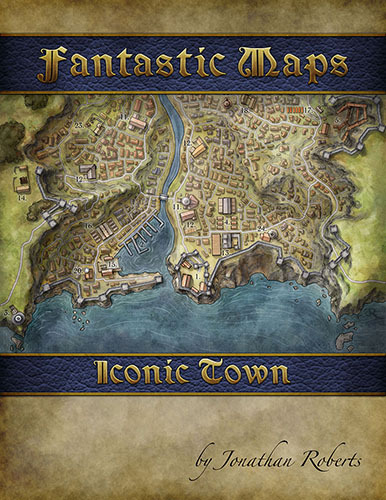 Free Maps for Personal Use! These look really useful! It's stuff like this I like and applaud - people helping other people, offering their own personal, homemade stuff, to add new variety to other people's games - for free. Sharing. What a concept! Remember: these are for personal use and are intellectual property of the creator(s). 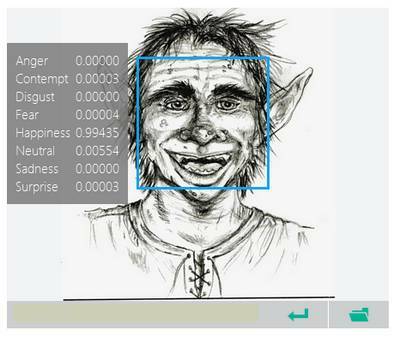 Analyze Emotions in Photo Faces... and Art! 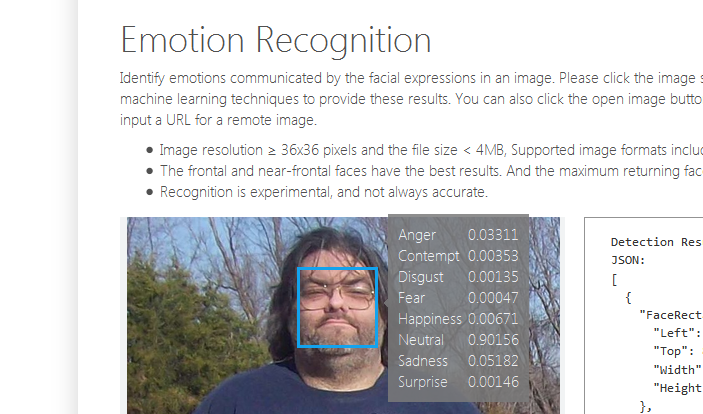 Microsoft has a photo recognition "tool" that finds faces in a picture and analyzes them for very broad emotions (happy, sad, neutral, etc). 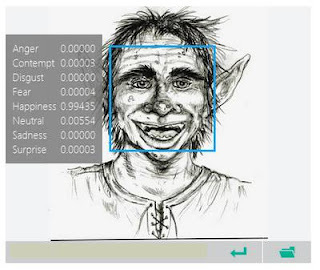 You just upload a photo to the site and it will put a square around each face it finds and you hover them to see what emotions their tool thinks are being displayed. They also have a tool to tell you if a picture is "adult" or not, but this post is about the emotion recognition. The weird thing about this is - it works with art! I had it analyze a number of my pictures and it found faces and analyzed the emotions the characters were displaying. It seems like this ... I don't know if I'd say it's significant, because It obviously finds "earmerks" common to all faces, but still - this means ... artists can relay fictional emotions for fictional characters? Weird, anyway. My View: Bernie Sanders, Hillary, etc. Even if I *could* speak for "all" of my party, I couldn't do it for Democrats because I'm an Independent, which is poised to become THE largest "party" in the US, bigger then GOP and Dems combined. Hillary comes off as extremely hawkish, which I don't agree with. She's a corporatist and/or Third Wayer, who is funded almost completely by Wall Street and Corporations. She has NEVER held these further-left views that she has recently espoused, and clearly has been driven that way by Sanders and even the other Dem candidates, no doubt much to the dismay of the DNC chair Debbie Washerman Schultz. Schultz, said, in an indulgent, amused tone as one would used with a child, when asked about Sanders or socialism of something: "Oh, pff, no. That's... the Democratic party is left-wing of course, but we're still American. We certainl aren't socialist" (paraphasing). And then when asked what the difference was BETWEEN Democrats and socialists, couldn't answer. (Maybe the first part of this paragraph was here reply, can't recall offhand). I don't pretend to understand everything in life or politics or money or social issues or whatever, and anyone that says they do is either lying or selling something, probably both. Sanders has stated his stance against (unnecessary) war, he's much more focused on income inequality, free tuition for 4 year colleges, breaking up monopoly monolithic corporations, actually setting tax rates right for PEOPLE, righting the economical spending, etc. A litany of things. Actual REAL progressive things. Not "liberal", past that - PROGRESSIVE. I don't care if he calls it socialism or ham-sandwichism. I'm not intimidated by words, and I judge things by what I can see or read or currently understand about them. I do lament the fact that "progressive" is a somewhat reviled term because it has been co-opted by leftist extremists the way some see other terms as also co-opted by leftist extremists, to authoritarian, speech stifling extents. 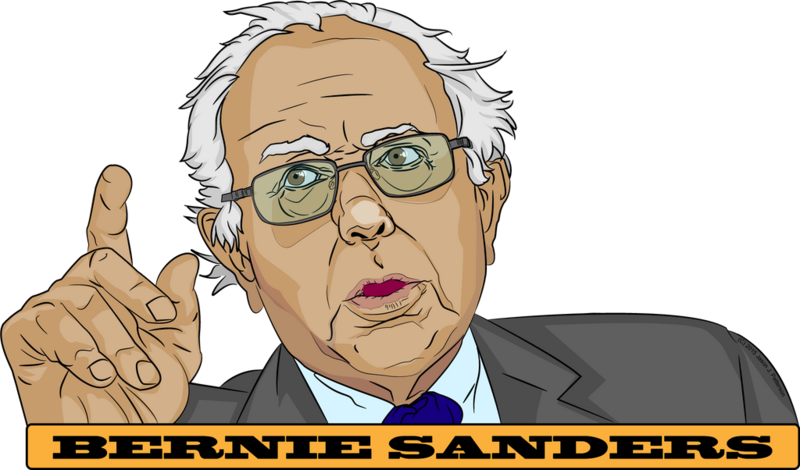 There is criticism of Bernie Sanders because he's "not a Democrat". That's still this same nonsense at work. If you compare him to ACTUAL *real* Democrats, from just a bit over a decade or so back, or especially multiple decades, he is the ONLY Democrat in the Democratic party. Hillary is CERTAINLY not one, and the media doesn't give enough exposure to the others to even tell. I don't claim to know the intricate details of exactly how Bernie is going to do X or Y, but you can say that about ANYONE. Whoever someone is voting for, that person very rarely will be able to comprehend what is involved in the claims they make, about how they're going to make certain things come about - and that is still on the general surface level. Unless you yourself came UP inside political circles, you really have no idea how the guts are cut, even if you understand the topic. Bernie Sanders isn't perfect. He's not "powerful", and yes he's been in politics for 30 some years. But in those years, you can look at his actions and his record, in politics and in society, and see how he've voted and what bills he's sponsored or voted for or against, and what sides he's been on during social issues. Sanders is one of the few, possibly the ONLY person that even comes CLOSE to being authentic and I believe he will do everything he can to make exactly the changes and put the plans into place that he says he will. I don't give that benefit of the doubt to ANY other politician in any party. Hillary, if elected, will immediately or as quickly as possible, return to her Neo-Republican roots and ignore, undo or twist any promises or claims she made that are "too left leaning" for the banks or corporations to be happy with. I wrote this on a forum in response to a lady that is concerned her 2 year old daughter cries nightly and is scared of a woman she "keeps seeing". I am not sure I believe a child that young can communicate in any meaningul way, at least I didn't even know what time or dates were until I was 7 and it was pointed out in class via a school room calendar that the year was "1980" - which was like handing someone a can of beans and saying "Tomorrow's red is puppy". I remember a very vivid (well, it used to be, I'm 42 now) dream about a clown - I've remembered it for a long time so it MUST have been when I was very young, though I realize with remembered dreams, it's unreliable to factually state much about them, but I'd say I was probably 3-5 maybe? This is possibly my earlier memory and was a typical clown but looking very scary and behaving, leaning and leering ominously - this was in like 1977 or so, I don't think I had any any cognizant knowledge or understanding of things like what a clown was. I've had some form of fear of clowns ever since this, and this *might* have been caused by something I happened to see on TV or a book (there was a killer clowns scare at some point, and John Wayne Gacy was around), but it could have just been dream imagery of something I had seen some earlier time (maybe Bozo on TV) that became a nightmare. DUSO the Dolphin - Teaching Toy or TOOL OF THE DEVIL?! Top 36 DeviantArt Search Images for "Wrestling"
2011 Jason J. Patterson. Watermark theme. Theme images by Ollustrator. Powered by Blogger.